Visible centre, the entrance from which a passage leads to a tomb chamber at the heart of the mound. Above the door is the "light-box", through which the sun precisely aligns at dawn on the winter solstice so as to shine into the tomb chamber. © Copyright Christopher Hilton and licensed for reuse under this Creative Commons Licence. This page has been viewed about 178 times. Stunning! What more can one say? I searched and found "Newgrange Megalithic Passage Tomb" - that helps, for a start - "The Megalithic Passage Tomb at Newgrange was built about 3200 BC. The kidney shaped mound covers an area of over one acre and is surrounded by 97 kerbstones, some of which are richly decorated with megalithic art. The 19 metre long inner passage leads to a cruciform chamber with a corbelled roof. 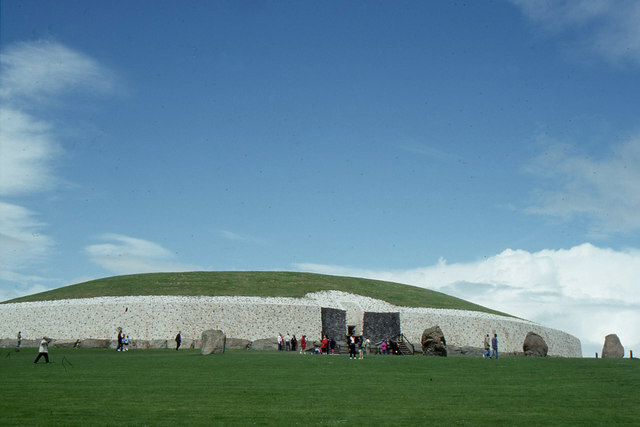 It is estimated that the construction of the Passage Tomb at Newgrange would have taken a work force of 300 at least 20 years."